The award has been conferred in recognition of the distinguished service rendered by Akshaya Patra for the children of India. Bengaluru - 1 February, 2016: On the eve of the nation’s 67th Republic Day, the Government of India conferred upon Madhu Pandit Dasa, Chairman of The Akshaya Patra Foundation and President of ISKCON Bengaluru, the prestigious Padma Shri. The award has been conferred in recognition of the distinguished service rendered by Akshaya Patra for the children of India. Akshaya Patra works with the Government of India and State Governments and is one of the most admired Public Private Partnerships in sphere of education and child welfare. Several scientific studies conducted by various leading research organisations such as A. C Nielson and Sigma clearly establishes the positive impact of the Akshaya Patra’s mid-day meal programme. Classroom hunger was addressed significantly, with attendance, enrolment and retention receiving a boost. The recommended nutritional requirements were being fulfilled and the food was found to be healthy, hygienic and tasty. Under his inspirational leadership, Akshaya Patra has grown from providing 1500 children with mid-day meals to 1.5 million children in 15 years, becoming the world’s largest NGO-run school lunch programme. A Harvard case study, the Foundation is poised to serve the 2 billionth meals later this month. Madhu Pandit Dasa has completed his B.Tech in Civil Engineering from IIT-Mumbai in the year 1980. While he was doing his M.Tech course in IIT-Mumbai in 1981, he dedicated himself to the service of humanity by becoming a full-time member of ISKCON. In partnership with the Government of India and various State Governments and inestimable support from many philanthropic donors and well-wishers; Akshaya Patra has grown from humble beginnings serving just 1,500 school children across 5 schools. 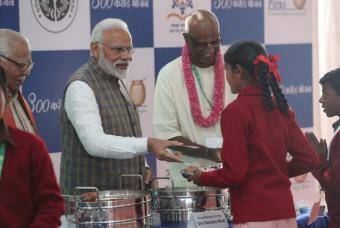 Today, Akshaya Patra Foundation is the world’s largest (not-for-profit) run Mid-Day Meal Programme serving wholesome food to over 1.4 million children from 10,845 schools across 10 states in India.